At the end of the day, the Theater One 2.1 left us wanting for more, which is crazy given its size. So far, the sound bases we’ve tested have disappointed. With the exception of the very capable Sony HT-XT1, the relatively new product category hasn’t lived up to its promise of replacing your sound bar with a sonically superior piece of furniture you can set your TV on. Sure, you can you put your TV on them, but the sonically superior part? Not so much. That’s a shame, too, because the extra cabinet space these designs afford should translate into better sound. With all that cabinet depth, better drivers could be used, more amps can flow to them, and the larger internal space could generate some really serious bass. Unfortunately, since “thin is in” these days, most of the sound bases we’re seeing give up too much function in the name of form, resulting in sound as waifish as their barely-there profiles. Then there’s the Pinnacle Theater One 2.1, which flips conventional designs the bird with a go-big-or-go-home attitude. 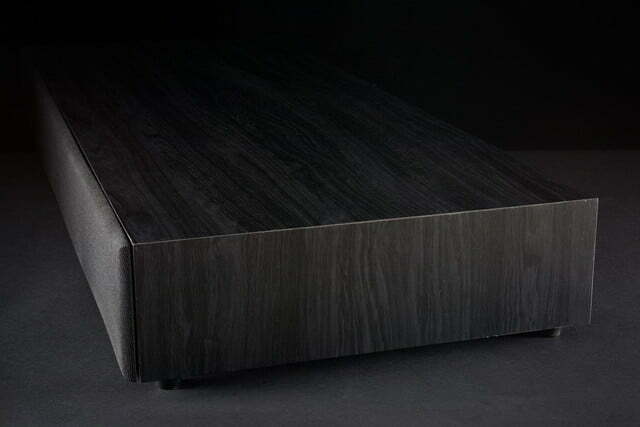 We’re talking about a sound base big enough to be mistaken for a coffee table, and on paper, it looks like it should pack a mean wallop, too. Armed with 6.5-inch down-firing subwoofer, a whole lot of cabinet volume and two bass ports, the Theater One 2.1 looks like it should have no problem delivering a bounty of bass. But does it? We aimed to find out, and learned a whole lot more in the process. 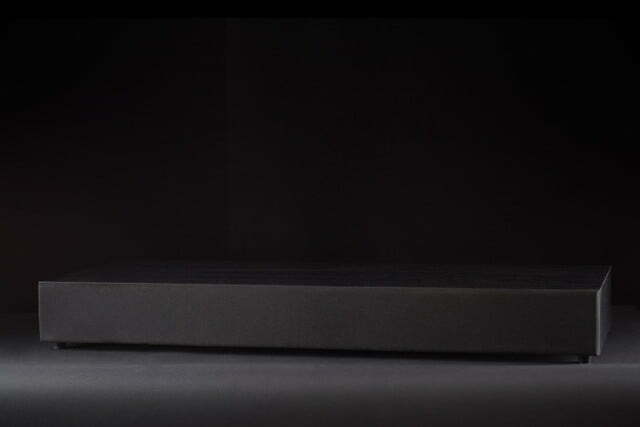 Of course, unless you order this sound base at Amazon, you may never see the box. That’s because Pinnacle’s products are sold primarily through custom integrators and installers. That seems a little ironic in the case of this product, which is meant to be a DIY audio upgrade by design, but … whatever. 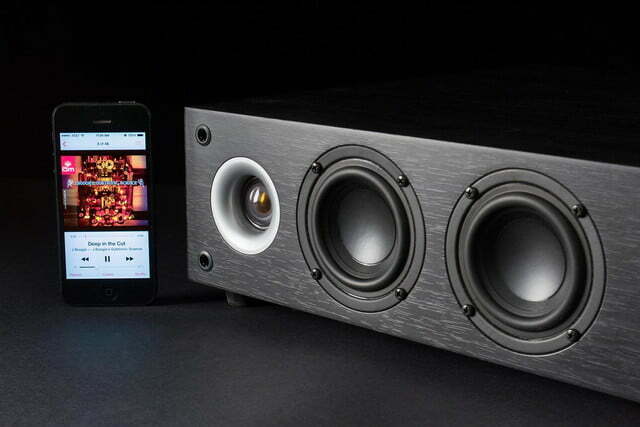 Despite its size, the Theater One 2.1 weighs a relatively meager 27 pounds. 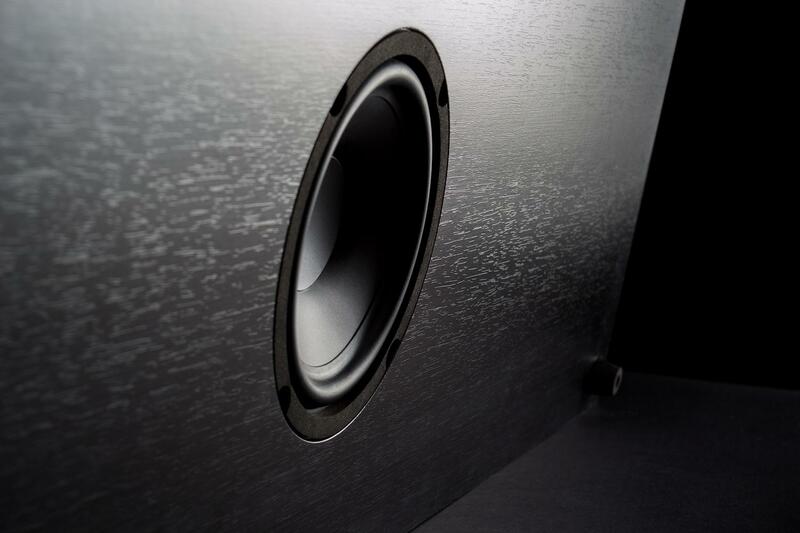 Between the sound base’s 15 x 38 x 5-inch dimensions and inclusion of a 6.5-inch subwoofer, we were expecting a bit more heft – we own a modestly sized center channel that weighs more. 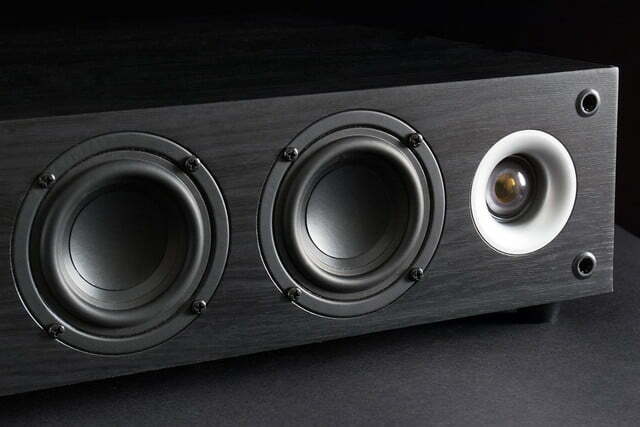 Thankfully, the speaker feels as if it is built solidly enough to handle a hefty television. 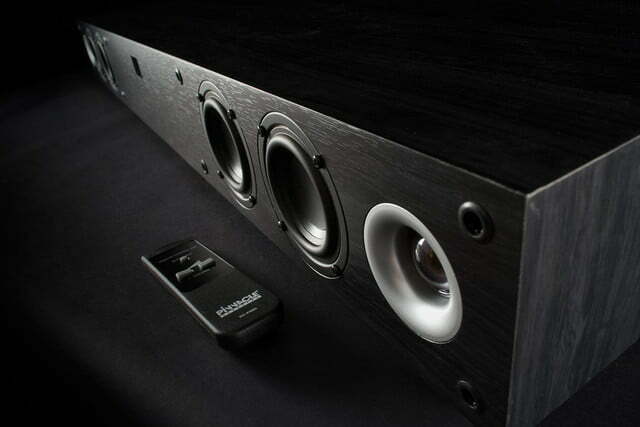 The speaker’s black wood-grain finish is nothing to get excited about, but it does a fairly good job of not calling undue attention to itself, letting your TV shine as the star instead. Inside the box we found the sound base, a power supply, power cable, remote control, optical digital audio cable, gold-plated RCA interconnect cables and a gold-plated 3.5mm to RCA adapter cable. Pinnacle claims the Theater One 2.1 can handle up to a 65-inch television, but we know from experience that will depend greatly on the make, model and year of the television. 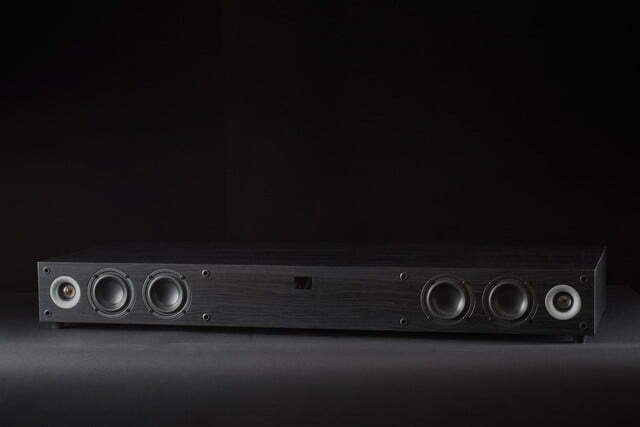 For instance, Sony’s XBR-65x900b and its wide-stance stand wouldn’t work, but the Sony XBR-65x900a would. Working from the outside in, the Theater One 2.1 uses two 1-inch silk dome tweeters and four 3-inch polypropylene midrange drivers. 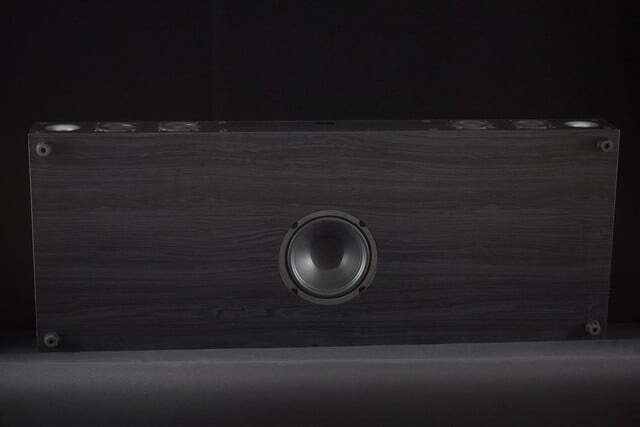 Underneath the cabinet, firing down at whatever it sits upon, is that 6.5-inch woofer we’ve already mentioned. Pinnacle doesn’t disclose the speaker’s output power, but the company does state it uses a digital amp, which is common with these types of speakers. 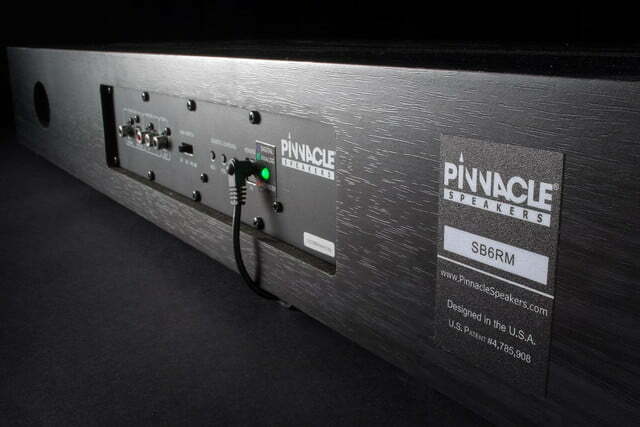 Pinnacle doesn’t mention the use of any DSP, either. 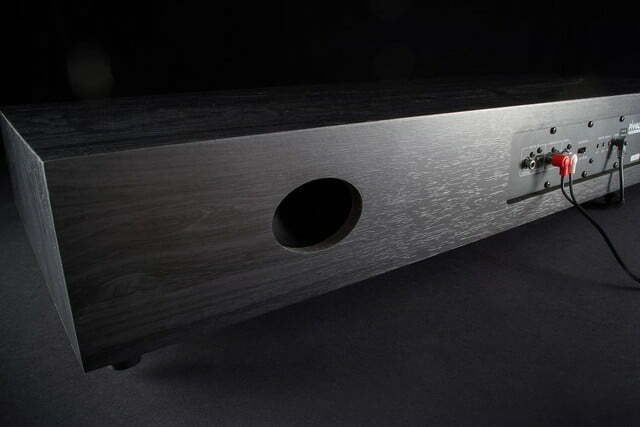 The speaker’s cabinet is ported twice to enhance bass response. 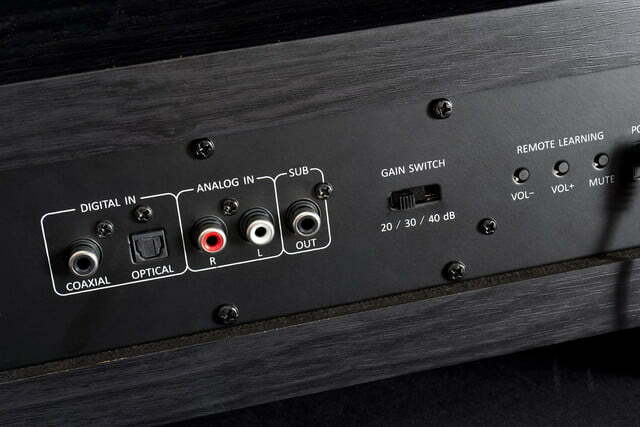 Sitting in between those oval ports is the speaker’s interface panel and its assortment of connections, including two digital inputs (one optical, one coaxial) a single analog RCA input, and a subwoofer output, in case extra bass is desired. We appreciate the ability to add a sub, though we fear most would prefer a solution that either didn’t need a sub, or afforded a wireless signal transmission. Not that the digital input only accepts PCM signals; there is no on-board decoding for Dolby Digital or DTS codecs of any kind. You’ll want to verify that your TV or Blu-ray player can be set to output PCM, otherwise an analog connection might be required. 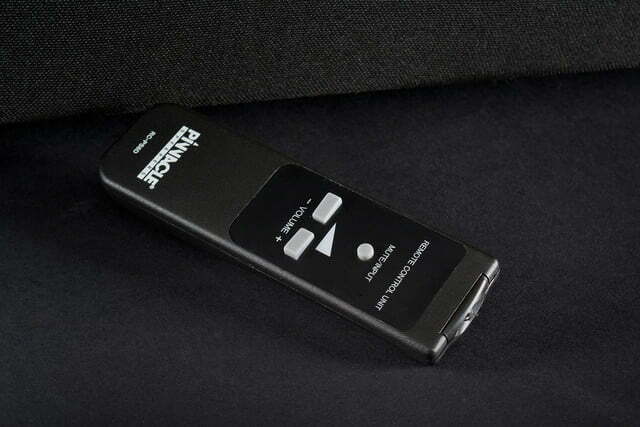 To control the Theater One 2.1, either the system’s remote can be used, or the speaker can be programmed to work with a TV’s remote codes using a built-in learning system. Either way, you get very limited functionality: volume control, mute and input selection is all you get. 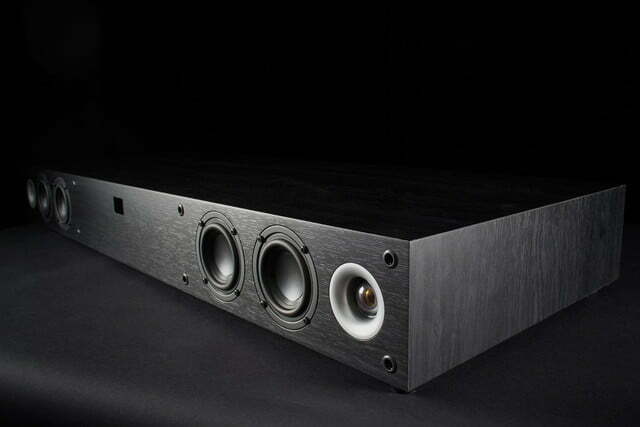 The Theater One 2.1 is a pretty large speaker, so we expected equally large sound. That’s not exactly what we got, but the news isn’t all bad. You get very limited functionality: volume control, mute and input selection is all you get. This speaker does a few things really well. First, stereo separation was surprisingly good, with effects having very distinct movement back and forth with no gaping hole in the middle. We also felt the effects extended beyond the speaker’s edges, though only to a small degree. Second, we appreciated the clarity with which the speaker reproduced dialog. It’s never chesty or muffled, not does it sound honky or forced. Voices always sounded natural, and enunciation was always concise and definite. Third, treble response was just spritely enough to call attention to certain details, and that sparkle added some zing to effects in movies as well. Finally, we were impressed at the speaker’s capacity for dynamics, noting significant dynamic swings were pulled off well enough to startle us from time to time. On the other hand, we were disappointed with the speaker’s bass output. After watching several movie clips, we started to think that the bass level was simply set too low. However, since there are no tone controls to speak of, there was nothing we could do about it. Explosions had a little bit of weight, but the speaker never really “moved” us in the same way the much smaller Sony sound base did. We decided to turn to music to analyze the speaker’s bass performance a little more closely. What we found was that the bass was mostly tuneful, keeping true to tone of bass notes and the resonance of a kick drum. But when we stepped in close, we did notice the speaker had just a touch of a “one note bass” effect, likely due to port tuning. At the end of the day, the Theater One 2.1 left us wanting for more, which is crazy given its size. If the speaker was going for its list price of $899 (as listed at Amazon), we’d be flat outraged. However, for the much more reasonable price of $300 (at Amazon), we feel the Theater One 2.1 does offer some value. It avoids sounding nasal, tinny, and generally small, and offers decent dynamics. 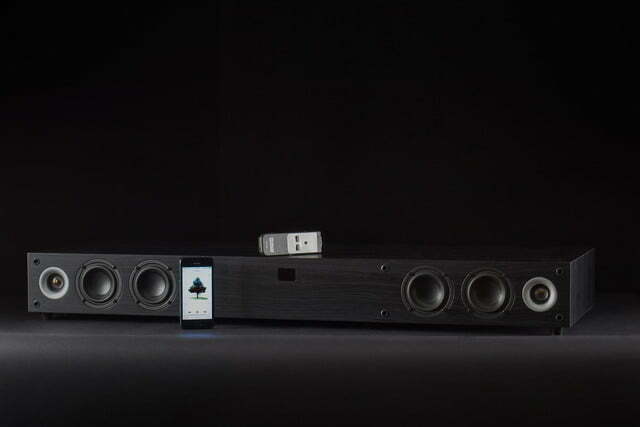 It’s not going to become the hub of your entertainment center — it lacks HDMI switching — but it will sure beat the pants off most built-in TV speakers. Can you do better for $300? Yes. But we aren’t aware of a competing speaker at this price that can hold a 65-inch TV, and that makes the Theater One 2.1 a somewhat unique proposition.